My journey with Swimmo started last winter; I was searching for a fitness tracker that would help me count and measure my progress in the pool. I had just started to really get back into swimming as I used to compete with Sheffield swim squad when I was in school. I really wanted to improve my fitness and I knew swimming was a strength of mine. 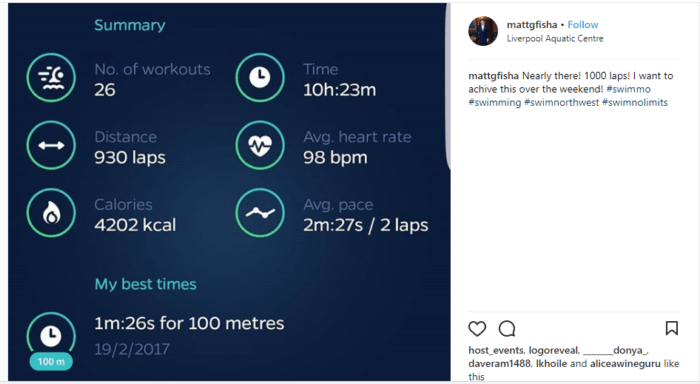 I was bored of counting lengths in the pool and wanted a tracker to help so I could concentrate on my performance and use it to set goals. 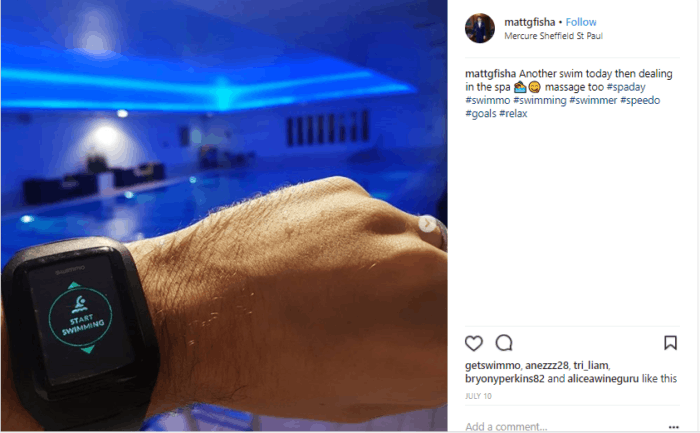 Last Christmas, I started using my new Swimmo watch and I was very impressed with its capabilities, to not only keep track of my lengths, but also the goals you can set. These goals have really helped me stay focused and improve my physical and mental well being. Swimming really has helped me settle into a routine; I usually swim for 30 minutes, 3 times a week in a 25-meter pool and usually go in the morning to start my day. When using the Swimmo watch, I set a goal of 50 laps and start my regular workout with basic stretching, as this is important to any workout to get the muscles ready. I first start out in the pool with 5 laps to warm up with breaststroke then this evolves into 10 laps of the front crawl to pick up the pace and get my heart racing. 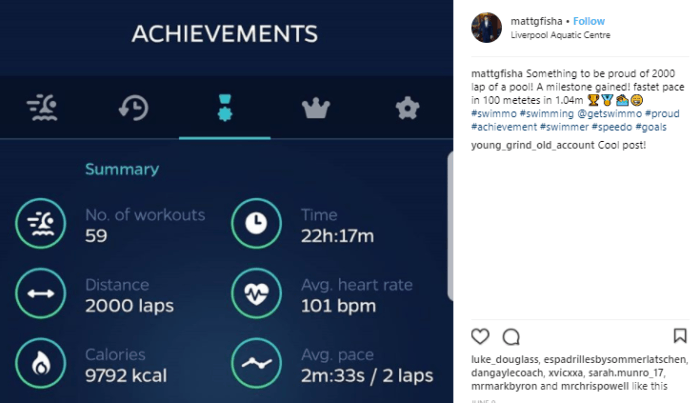 After my blood is pumping, I take a little breather and get stuck into training my upper body with just using my arms for breaststroke; I swim one length then I sprint back with a powerful front crawl. I repeat this for 10 laps. Now, I am on 25 laps, I am halfway through. I cool down after the sprints with 5 laps of breaststroke, I then swim 10 laps of front crawl then afterward I do 5 laps of front crawl using my arms and for the last 5 laps I cool down with breaststroke. Depending on how much time I have left I may swim longer which will change my last few laps. I usually get to 50 laps in about 25 minutes and this is without overexerting myself. I have been to numerous destinations around the world this year and I always ensure that I have researched what pools there are close by. Having the watch with me motivates to achieve the goals I have set. 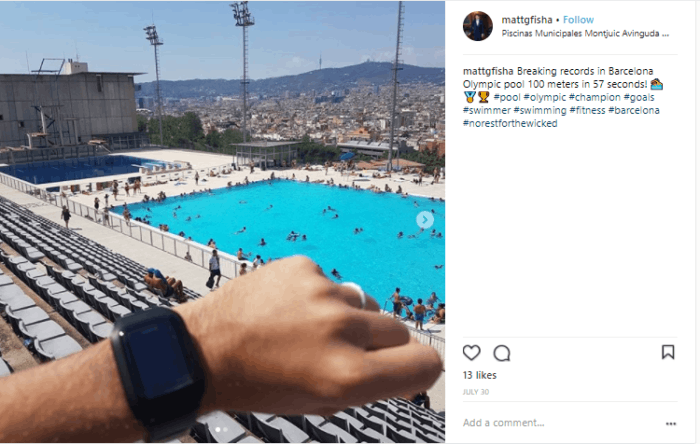 One of my favourite trips this year was when I visited the Olympic pool in Barcelona. Seeing an open air stadium like this was incredible; you could see the whole of the city from there! I must admit I did get carried away in the pool and swam for over an hour in the 30 degree heat! However, the Swimmo watch will adapt to different pools and could track my progress seamlessly in a longer pool. In November this year, I had reached 4000 laps since I started out. I knew that it had almost been a year since I had been using the Swimmo watch and I was inspired by my friend to set another goal. So I decided to set a promise to myself to swim 1000 laps by New Year’s Eve 2017. I am adamant that I will be able to achieve this goal; I am so motivated. In my head, I know I could do it, I had planned if I swam 3 times a week over 2 months I could easily do it. Although in the back of my mind I was afraid that I might not achieve this as I knew holiday season was coming up and I know how distracting the festivities of Christmas time can be. Even though I was aware of this, it made me more motivated to swim that bit more every time I go. I could always compensate if I had to miss one session. Luckily, I have not missed one session and instead, I am now ahead of schedule and I can now see I will achieve my goal in time. I now only have 200 laps to go and it’s only less than 3 weeks away from deadline day. So, I know I only have to swim another 4 sessions and I will have completed my goal. My physical appearance has changed since using Swimmo which I am very proud of; I have more muscle definition than I have ever had. Swimming has also helped my mind, I love going swimming because I can totally zone out from all of the stresses that life brings you. It helps me focus on goals I set and with the help of Swimmo, I can say I have developed in ways I could not have imagined. I am looking forward to achieving my goal this year and I will have completed 5000 laps in one year with Swimmo! I am really looking forward to 2018 and setting more targets. Thank you for taking the time to read my post, I welcome any feedback and advice.